The Moonkeeper is a very distinctive platform adventure game with some of the most unique and charming aesthetics I have ever come across. In general it reminds me of a DOS game called Captain Comic that was among the first video games I ever played. I enjoyed it very much - I suppose you could say it was a formative experience for me - and for some of the same reasons, I enjoy this game too. The gameplay and premise are very simple. Through a rather awesome intro screen, you are told that, in the year 2000 (the game is meant to resemble a fifties science fiction film, I think), your advanced space man must travel to a Moon Base to fight off an alien plague by hunting down and destroying five Gestation Pods. Story is minimal, but it is told with humour and charm, mocking science fiction and video game conventions in fine form. Sometimes I think the game is perhaps a little too silly - perhaps a little more serious a tone overall would enhance the humour of the sillier moments. But in general I found the story more amusing than not. Gameplay-wise it is like most games of the Metroidvania type; you can run, jump, and shoot, and you collect items to gain new abilities. It is mostly a very fun game, but it is not without a couple of rather significant troubles. The physics in the game are not the best I've ever encountered, and this can be trouble. The game banks a little too heavily on the player's mastery of an honestly slightly frustrating jumping system (I found it a useful technique to wait until my character was almost entirely over the edge of a platform before jumping). It is also rather unforgiving, often requiring the player to trudge through multiple rooms just to get back to one very difficult spot. 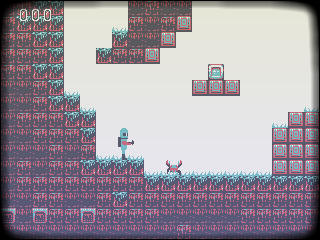 Also, since views don't move with the player, sometimes one overjumps a platform, and this tends to feel unfair. Health is not replenished upon reaching a save point, necessitating careful playing. The fact that I finished it, though, and was furthermore left with a quite positive impression, is I guess a sign that it's compelling enough to make up for the frustration. It helps that it is not a very long game, taking only an hour or two. The graphics are the game's strongest spot. The game is, in my opinion, gorgeous. Its limited colour palette, pixellated yet detailed tiles and creatures, and movie-projector-type screen flickers conjure up thoughts (for me, anyway) of some fantastical prototype video game system from the 1950s. I don't think there was ever a real video game system that looked quite like this, yet the game manages to have enormous nostalgic charm for me. Somehow, the game combines the looks (and storylines) of old games and even older films to great effect. It is probably the graphics that remind me the most of Captain Comic (the characters look pretty similar, as do the environments to some extent), though I suppose the nonlinear gameplay and even the physics are similar too. I also should mention that I loved the sound. There is no music except in the opening and ending sequences, but this was enough; they perfectly emulate a PC speaker in all of its obnoxious blopping low fidelity, and I like that. The sound effects sound equally faithful, and equally appealing to me. This game was a powerful throwback, for me, to technologies and styles that I hold very close to my heart. You might not like it as much as I do, but if nothing else, it remains a pretty fun game. Recommendations: The 2 people who like The Moonkeeper also like the following games. This is fun,but nothing like captain comic. This game reminds me of the DOS days. I'd say if you liked DOS, you might like this game. I thought there was a clear objective, it was fairly obvious as they told you you had to find the pods and kill them. They stated that exactly in the beginning. I believe the point was exploring, and i did that and beat the game in a bit less than an hour and enjoyed every second of it. Not perfect of course, i suppose some more variety would be nice, but it didnt stop me from playing all the way through. Let this be a lesson to you; read the beginning. I couldn't get very far in the game, it would crash at random times. From what I did get to play it was pretty fun, aside from all the negative things Mooseyfates already covered. This game doesn't have much to offer besides nostalgia. The graphics are actually pretty good, but there really isn't very much variety. The game was so nonlinear that I didn't know what to do and really had no reason to continue playing. Yeah, I shot some little bug pods, but is that vital to win? I don't know, and if it is, it doesn't make any damn sense. If there were a clear objective, like always try to move right or somehting as in many old games, it'd work. Having to use grenades to kill short creatures becuase the programmer did not allow you to tilt your gun down is ridiculous. Oh, and there are several tiems when you fall without knowing what is happening in the next screen; I was hit several times that way. absolutely amazing! Reminds me of Duke Nukem 1 and Metroid, that's a good way to describe it. Great throwback game with cool filter effects.